What the hell have we just watched? We've come to learn over the years that Spanish teams bloody love themselves a good official unveiling ceremony for new signings. You know the drill. A player will walk out onto the pitch wearing his new team's full kit, wave at the crowd a bit, do a few keepie-uppies and pose for photographs. This is usually followed by a press conference in which the player tells the media how he's always dreamed of playing for his new club, who are one of the biggest teams - if not the biggest team -in the world. It's all so wonderfully predictable, really. With this in mind, let's take a minute to admire the show Villarreal put on to reveal that Santi Cazorla had rejoined the club. 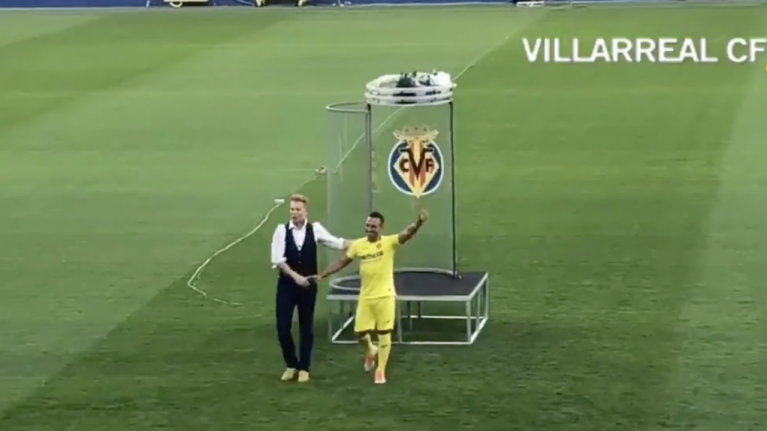 Yes, Cazorla donned full kit and yes, all this took place on their Estadio de la Cerámica playing field... but this unveiling ceremony was certainly a little very different from anything we've seen before. A 4m² stage was erected on the pitch, with a large empty glass cylinder placed on top of it. With Cazorla nowhere in sight, a magician set about dancing around the cylinder which began to fill with white smoke. Dramatic music played, and as the smoke began to subside, Cazorla appeared, standing rigidly inside the cylinder, as if cryogenically frozen for the last couple of centuries. Certainly not how these things usually play out, is it? Cazorla played for Villarreal between 2003 and 2006 and then again between 2007 and 2011. The former Spanish international left for Malaga but later joined Arsenal in 2012. Now 33, Cazorla endured an injury nightmare towards the end of his stint in London. Having undergone eight surgeries following an injury sustained in a Champions League game against Ludogorets in October 2016, he revealed how his foot could have been amputated after infection set in in his right achilles tendon. Although doctors told him he would never play again, Cazorla has done enough to earn himself a contract at Villarreal, leaving Arsenal after it was announced Arsene Wenger would be replaced by Unai Emery.